Is Mystery Shopping A Scam? Or Legit Work Opportunity? Last updated on January 15, 2019 By Guest Writer Leave a Comment This post may contain affiliate links. We appreciate you supporting Rags To Niches! Full disclosure here. These days, many people are looking for ways to make extra money and boost their income. Legitimate work from home/freelancing opportunities, (when you don’t have experience) are quite limited and the amount of scams you can fall into seems to be never ending. Many opportunities are there that promise a few more bucks without really too much effort – but many of those pay very badly. However, Mystery shopping is one opportunity that, on the surface, seems to provide people with a low-effort way to make some extra money. But are these real opportunities? Is Mystery Shopping A Scam? 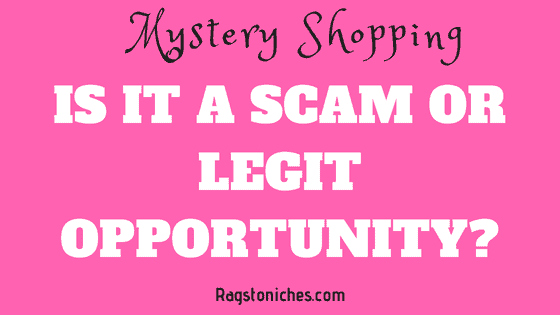 If not, how can you tell a Mystery shopping scam, from a legit opportunity? I will try and answer these questions throughout this post. Mystery shopping is employed either internally by companies’ watchdog companies, or market research companies to check out on various standards within a business – and whether they are being upheld! By sending in people undercover into a business, all sorts of data can be monitored that may not be caught during a scheduled inspection. Some of these things could include regulation compliance, service quality or just particular facts on products and services that they could be offering or intend to. For a decade, mystery shopping has earned people various incentives – as well as extra cash and mainly because it does not need many qualifications to participate. This has made the option attractive to many people looking for work-from-home opportunities. However, today some companies apply specific regulations as to who should be engaged and for what task. This is because mystery shopping is no longer pure shopping, but could involve services which are more specialized. The mystery shopping jobs are meant to be supplemental, (not a full-time income) and it could start off with as little as 5 dollars for a job. The work itself is not complicated and could be accompanied by offers like free meals or petrol/travel costs and expenses. Different service enterprises including airlines, caterers, hospitals, call centers and others employ people to go undercover and pose as customers. A mystery shopper could be employed from all walks of life. For example, a hotel seeking to do an ADA compliance test will engage a real disabled person as their mystery shopper. A hotel owner will want to know how well equipped they are for assisting someone with a disability, as well as how they are treated! There will be specific guidelines for every task that you will be given and you’ll need to follow these to the best of your ability. A mystery shopping task is not a regular shopping spree, but may include many precise goals and activities that you’ll need to carry out meticulously. You’ll need to treat it with as much commitment as any other paid work opportunity. • Anticipate working your way up: Obviously, you begin small and with small tasks. In the small tasks, you will prove yourself worth more essential and sophisticated job which will offer you good deals. To achieve this, be keen and detailed in your assignments. In a coffee restaurant, for example, the temperatures of the coffee, as well as the details of the service, will count in your report. Shoddy tasks disqualify payments and could prevent you from getting other assignments. • Avoid unsolicited offers: For proper jobs, ignore the pop-up gigs in your emails and go for legitimate openings especially at MSPA Americas site or better research at Glass Door. In other countries seek information on approved business bureaus. Do your research prior to accepting any sort of job offer. • Be wary of pop up links: There are chances of scammers bluffing into legit websites. Stick to your site because otherwise, no company is that willing to give space to competition. • No advance payments should be made. • Mystery shopping has become more professional: more is expected from the mystery shopper now and once you have experience and good feedback, you may be able to get more jobs available to you. Why Is Mystery Shopping Often Seen As A Scam? • The job is not that complicated but could pay reasonably well, especially for those who are already experts in their field. So, some people may initially think that this opportunity looks too good to be true. 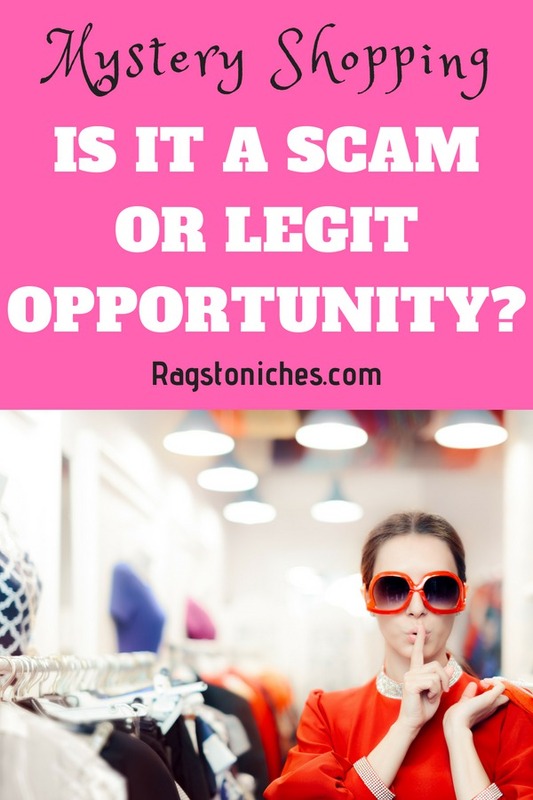 • With lack of employment prevalent and debt increasing, many people out there have been scammed into opportunities and some of those out there are related to mystery shopping. • Real and certified Mystery shopping companies demand proper work from their employees and expect good quality. Unfortunately, people may talk more about the bad experiences they’ve had, rather than the good. • The scam like pop-up adverts that people may have experienced will likely have caused many people to feel skeptical about any real opportunities. Unemployment has become a real issue in today’s society. People seeking employment are hard-pressed and will do anything to increase their income. This has influenced other money seekers to prey on the most desperate and vulnerable. Here are some things to watch out for…..
• Mystery shopper jobs postings either online or on newspaper posts: If an assignment is followed by money requests for various transactions that will later be disbursed, stay well clear! • A prior payment that involves checks, that you are supposed to use your money to recover the checks. These are fake and can lead to people being access your bank accounts. • Training and certification fee: If a company is posing as an employer but will need you to pay for specific training, the chances are that you are in for a sophisticated scam. If you are looking to be employed in a legitimate business; just remember – an employee gets PAID and does not pay the employer for anything. Basically, it is important to check if the prospective company is listed by MSPA. On their website, they also regularly update prospective mystery shoppers on current scams. Any legitimate mystery shopping company is normally certified by the Mystery Shopping Providers Association (MSPA). So, bear this in mind when you’re looking for legitimate opportunities. • HS Brand Internationals and many others. What Are Some Of The Services Regularly Offered? Can You Trust Mystery Shopping Work? With the explosion of technology and the internet, businesses can link up online with willing employees from all walks of life and from all over the globe. While this has opened doors for many scams online, it has also opened the doors to many real opportunities as well. Many of which, people are not aware exist. Mystery shopping is not a scam and there are real people out there who do make money in this field. Unfortunately, there are scams in pretty much every area of potential employment and within any opportunity where you could potentially make money. With so many people in debt, unemployed and desperate for money, an ever growing amount of people can end up taking risks with opportunities that turn out to be scams. Mystery shopping is not immune to this and hence many scams out there lurk under the guise of mystery shopping. That being said, there are still legitimate opportunities out there – you just need to proceed with caution! Do you have any experience with Mystery Shopping? Let me know tn the comments! This post was outsourced via Hirewriters – where you can find quality writers for your blog or website. Beyond Mystery Shopping…. What Else Can You Do? If you’re looking for extra income opportunities, or are even looking for something that could turn into a full-time income over time, there are legitmiate ways you can make money from home & online. The trouble is, trying to navigate the real opportunities from the fake ones and that can be difficult. If you’re looking to just get started: check out my 40+ ways to make your first dollar online, (and scale up from there!). I personally make the most online right now, from having my own blog. I started creating blogs & building websites in 2015 and I had no idea what I was doing, I had no technical knowledge & no experience. But in order to make some money from a blog, all you need is to generate traffic. Easier said than done, that part takes time. I get all my traffic for free, mainly from the search engines. Once you start generating some traffic, there are various ways you can earn. Whether that be from paid advertising, through sponsored content, creating your own products, or affiliate marketing. If you’d like to learn how to make money from a blog or website – this is where I got started!